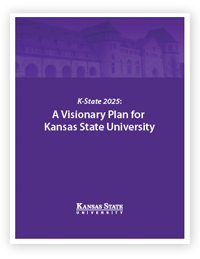 The mission of Kansas State University is to foster excellent teaching, research, and service that develop a highly skilled and educated citizenry necessary to advancing the well-being of Kansas, the nation, and the international community. The university embraces diversity, encourages engagement, and is committed to the discovery of knowledge, the education of undergraduate and graduate students, and improvement in the quality of life and standard of living of those we serve. 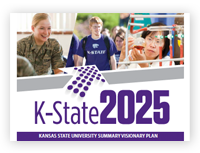 By 2025, Kansas State University will be recognized as one of the nation’s Top 50 Public Research Universities.